OKANAGAN SHADE AND SHUTTER LTD. (OKSS) is the official Dealer Representative in Vernon, BC for Mirage Screen Systems Inc.
Mirage Screen Systems Inc. is the manufacturer of the Mirage retractable screen doors, a feature-packed, top quality screening system. Mirage is headquartered in beautiful Surrey, BC where it is locally owned and operated and proud to be a member of the Greater Vancouver landscape. The dynamic management team continually search for new ideas and partnerships in order to maintain its position as one of the industry leaders in in the manufacturing of high quality retractable screening systems. Mirage is recognized as a leader in innovation and quality, not only by its consumers and dealers/installers but also by its competitors. We Service the Vernon and surrounding areas for all your Retractable Screen needs. Components that are engineered to last! Locate your local Mirage Dealer to have them show you the difference! Mirage routinely cycle tests its product 250,000 times, the equivalent of 69 years of use if used 10 times daily. That’s the Mirage Retractable Screen Door quality you can count on! To help you keep up with the latest trends in home decorating Mirage Screen Systems carries retractable screen doors in dozens of the latest architectural color schemes. One of the key benefits of Mirage retractable screen door color options is the ability to blend your new retractable screen with your home so that it is virtually unnoticeable. You can make certain of this when you buy a Mirage retractable screen door because whatever color you may be looking for or trying to match, Mirage Screen Systems has you covered. White and black retractable screen doors are the most popular but Mirage also carries standard colors in cream, wood, grey, and two shades of brown. Can’t Find The Retractable Screen Door Color You Want? Disclaimer: Colors may not appear exactly as shown. Contact your authorized Mirage dealer for proper color samples. Please note an additional charge applies to our designer, wood grain, and custom color program(s). Our Mirage retractable screen door products are routinely cycle tested up to a quarter million times! That equates to about 69 years of continuous use if you average using your retractable screen door 10 times per day, 365 days of the year. In other words, our retractable screen doors are designed for real world use. Mirage Screen Systems strives to make the best quality retractable screen door products possible. We are proud to have developed a solid reputation for making retractable screen doors that have the longest trouble free life span on the market. And, our products are easy to install, easy to use, and packaged to compliment the décor of your home. Terms and Conditions Mirage Screen Systems Inc. warrants solely to the original purchaser of Mirage Screens that the screen purchased shall be free from defects in materials and workmanship under normal use for as long as the screen is owned by the original purchaser and until the ownership of the screen is transferred to another. This Limited Warranty does not apply to: (a) damage due to normal weathering, chalking, scratching, fading, corrosive atmosphere contaminants (eg. chemical fumes, pollution, salt), volcanic ash, lightning, windstorms, tornadoes, or any other act of God, explosions, riots, civil disturbances, war, misuse or abuse, or other causes beyond the control of Mirage Screen Systems Inc. b) non residential applications (c) mesh and mesh components; (d) asserted defects caused by modification, misuse, or abuse, or improper maintenance of the screen; (e) asserted defects* involving subjective personal likes or judgments**; (f) defects asserted by any purchaser who did not purchase the screen from an authorized Mirage distributor or dealer in the United States of America or Canada; (g) defects asserted by any purchaser who did not have the screen installed by an authorized Mirage distributor or dealer; or (h) asserted defects caused by doorway conditions beyond the control of Mirage Screen Systems Inc., its authorized distributors and dealers. Exceptions: Motors, electrical accessories and chain drives: Mirage Screen Systems Inc. warrants the electronic motors, electrical accessories and chain drives for a period of five years, commencing from the date of installation for the original purchaser, against failure under expected normal use. Warranty is void if the electrical motor or electrical components are exposed to water, acts of God or abnormal conditions. *The term “defect” as used in this warranty, is defined as imperfections which impair the utility of the product. Wrinkles in the mesh or puckering along its edges in itself does not constitute a defect. **Combinations of mesh fabric, fabric production lot, unit size, location and wind conditions may cause variations in the fabric’s appearance and smoothness of extension and retraction of unit. This warranty includes the costs of removal, shipping and installation of the defective materials for a period of one year from the date of original installation by an authorized Mirage distributor or dealer and a lifetime on all parts with the exception of mesh, speed reducers and their components, excluding installation and shipping. The obligations of Mirage Screen Systems Inc. hereunder are limited to repair or replacement (at our sole discretion) of affected parts of the screen found to be defective under this Limited Warranty. In no event shall Mirage Screen Systems Inc. be liable for damages of any type, including, but not limited to: economic loss; or any indirect, punitive, special, incidental, or consequential damages of any type, including, but not limited to, time, wages or lost profits, of any nature or kind or for damages to or loss of property, whether caused by negligence or otherwise. Any implied warranty, is hereby limited in duration to that of the express limited warranty contained in this document, unless a shorter period is permitted by law. This document sets forth the entire liability of Mirage Screen Systems Inc. with respect to Mirage Retractable Screens. Some states and provinces do not allow limitations on how long an implied warranty lasts or the exclusion or limitation of incidental or consequential damages, so the above limitations or exclusions may not apply to you. Mirage Screen Systems is dedicated to helping you find the right retractable screen door solution for your home or unique outdoor space. 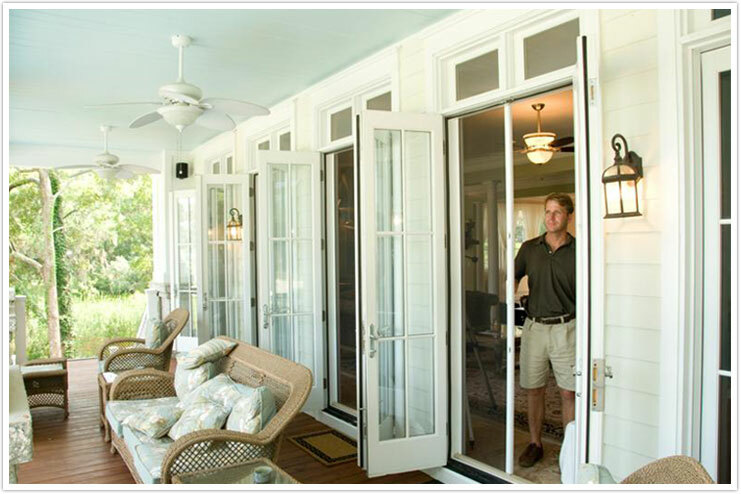 This retractable screen door FAQ page should answer most of your questions. For any additional questions please contact your local authorized Mirage dealer who would be more than happy to provide a free consultation. To find an authorized dealer near you, use our Dealer Locator tool. What is a Retractable Screen Door? Where can I buy a Mirage Retractable Screen Door? Is the Mirage Retractable Screen Door Durable? Do Mirage Retractable screens work on any door? Why is Mirage the best retractable screen door on the market? How much do Mirage’s retractable door screens cost? How do I fix a Mirage Retractable Screen door if someone walks into it? Do Mirage Retractable Screen Doors help reduce the cost of air conditioning? Do Mirage Retractable Screen Doors require cleaning and maintenance? Will Mirage Retractable Door Screens reduce glare on my TV or provide any solar protection? Does the Retractable Screen Door stay closed when a pet or person brushes up against it? I want to make a statement – what colors do Mirage Screen Doors come in? Do you have large retractable screen doors for an overhead garage door? Do Mirage Retractable Screen Doors have a backer on it? Will a Mirage Retractable Screen Door slam shut? Can I replace my sliding patio screen door with a Mirage Retractable Screen? Can I install a Mirage Retractable Screen on the door between my garage and house? How do I install a Mirage retractable screen door? How long does it take to install a Mirage Retractable Screen? What is the Mirage Retractable Screen Door warranty like? What is a Retractable Screen Door? For those who have not used a retractable screen door before, these are insect screens that roll into a compact housing. Retractable screen doors are designed to not interfere with your regular door function and you only see the door screen when it is in use. The retractable screen easily extends from the housing and is held in place by a magnetic latch. The door screen easily retracts with the help of a spring-loaded roller tube that is built into the unit housing. The majority of homeowners prefer a retractable screen door over more traditional slider doors as they do not obstruct landscape or vista views. When you book a retractable screen door consultation your local authorized Mirage Screen Dealer can demonstrate how the retractable screen works, using a tabletop model. This will help you visualize how it can work in your home! 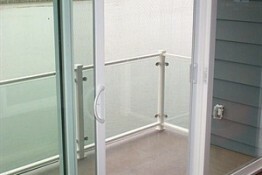 Alternately, please view our retractable screen door photos and demo videosonline. Where can I buy a Mirage Retractable Screen Door? Our retractable screen doors are available throughout North America through ourAuthorized Dealers. Is the Mirage Retractable Screen Door durable? Perhaps the best way to answer this question is to say that the majority of feedback from our dealers across North America (who install various types of screen doors) is on how durable our retractable screens really are. Mirage Screen Systems is virtually free from service calls, from day to day, and from year to year. Unlike other flimsy and mediocre quality retractable door screen brands, Mirage Screens are practically problem free! Learn more about Mirages’ built to last mantra! Do Mirage Retractable Screens work on any door? Yes! Mirage retractable screen doors are fully customizable to fit almost any type or size of door including in-swing and out-swing doors. You will be glad to know that Mirage Screens also work on French (double) doors as well as sliding glass patio doors. Your local screen door dealer can custom install your new Mirage retractable screen door; up to 108” high and up to 55” wide (or 110” wide for a French door). If you have a large door opening, Mirage Screens also offers motorized screens as wide as 25 feet and as high as 16 feet in a single unit. These motorized screens can be as small as 3 feet by 3 feet. Please ask your local authorized Mirage Screen Dealer for additional information on automated screen solutions at just the touch of a button. Why is Mirage the best retractable screen door on the market? Rather than sales copy here we’ll just say that in a side-by-side comparison, our product’s quality is evident and can speak for itself. Not all products on the market are the same. Mirage was one of the first retractable screens on the market and has the experience to ensure an extremely high quality product. We highly recommend you shop around and compare retractable screen doors to make sure you get the right one for your home. The screen specialist who takes care of your customization and installation is also important during this buying process! How much do Mirage’s retractable door screens cost? When you factor in the level of quality, customer service and skilled installation, you’ll find that Mirage Retractable Door Screens are very competitively priced. Each screen door is unique and customized for your entryway(s) and as such an authorized Mirage Dealer will be able to provide an accurate cost estimate. A simple phone call with a dealer is often all it takes to get a quote! The Mirage Screen Door Dealer will ask a few questions to make sure you get the right retractable screen door for your home and then provide a price. Please note that some door screen solutions may require an in-home visit before the quote can be provided. How do I fix a Mirage Retractable Screen door if someone walks into it? Rescreening our retractable screen doors isn’t a big deal. Just contact your localauthorized Mirage dealer to arrange a rescreening appointment. Do Mirage Retractable Screen Doors help reduce the cost of air conditioning? Yes! Mirage Screen Doors are designed to boost the flow of fresh air into the home, which naturally cools your home. This is a great “green” energy efficient alternative to running costly air conditioning units. Remember, a better ventilated home not only reduces your air conditioning bill but also makes you and your family more comfortable. Do Mirage Retractable Screen Doors require cleaning and maintenance? You’ll be amazed how simple our retractable screen doors are to clean and maintain. And when you do, they operate incredibly smoothly and maintain a like-new appearance. In fact, most of our customers are drawn to the fact that Mirage door screens are very low maintenance. Our annual maintenance plan recommends that once a year you clean and clear the tracks, vacuum the housing for dirt and debris, and then liberally lubricate the top and bottom tracks and plastic guides with Mirage’s silicone spray lubricant (available from your dealer). We also recommend that you inspect the door screens for cuts, scratches or holes. If you find holes or damage, we recommend repairing and replacing damaged screens right away. You can read moredetails about door screen cleaning and maintenance or speak directly with your local Mirage dealer. Will Mirage Retractable Door Screens reduce glare on my TV or provide any solar protection? At Mirage, we recognize the benefits of a multi-functional screen door solution. This is why we offer a number of solar protection options for your home, whether it is keeping the glare off your TV or adding shade to your outdoor space. Please speak with one of our authorized Mirage Dealers who can help you assess your requirements. Our Mirage dealers are up for the challenge of solving your problems with our quality product. Keeping your home livable and comfortable is our goal! Does the Retractable Screen Door stay closed when a pet or person brushes up against it? Yes! With our secure Super Magnet latch system that is 3 times stronger than our competitor latches, you can be sure that the Mirage retractable screen door will stay closed. The Mirage Super Magnet latch is anti-corrosive, unlike any other competitor screen system, which means no more rust. I want to make a statement – what colors do Mirage Screen Doors come in? At Mirage Screens, we are designers at heart. We offer a limitless selection of colors with our unique custom color match program. 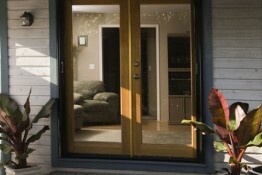 Mirage Screen Doors come in seven standard colors, 10 different wood grain colors, and 25+ designer screen colors. Your Mirage Screen dealer can help you pick a color that blends with your home’s style or makes a bold statement. Do you have large retractable screen doors for an overhead garage door? Absolutely! For this application the Mirage motorized screen door solution is probably best as it comes in sizes up to 25 feet wide and 16 feet tall. The best part of our garage door screens is that they are motorized – meaning you can open and close them at the push of a button. We invite you to visit our photo gallery to see how these motorize screen doors can work in your home. Or contact a local Mirage Dealer for further details. Do Mirage Retractable Screen Doors have a backer on it? No, because a backer is not beneficial. In order to clean your screen door each season (or year) you need to be able to completely extend the screen mesh material. A backer prevents you from doing this and would require you to hire a technician to come to your home to remove the backer and then reinstall it after the screen has been cleaned. 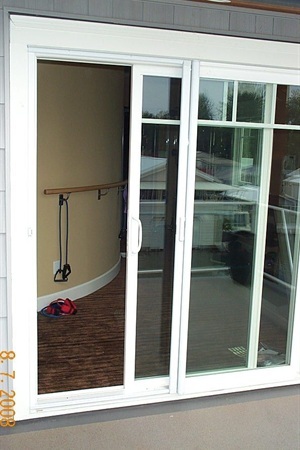 Backers are not easy to remove and interfere with the normal maintenance of your screen door. Will a Mirage Retractable Screen Door slam shut? No. Nothing is more annoying than a screen door that slams shut, and Mirage screens will not do this. Your Mirage dealer will install your door so that it will open and close exactly how you choose. Perhaps you need a high tension screen to resist wind, or a very loose tension to reduce door slam. Please keep in mind that the tauter the mesh screen is the longer it will last. In addition to tension control, Mirage Screen doors can also be equipped with Soft-Close technology that prevents accidental slamming. With Mirage, you are in complete control of how soft or quickly your retractable screen door closes. Can I replace my sliding patio screen door with a Mirage Retractable Screen? Most definitely! This is a popular alternative to rickety patio screen doors. The Mirage retractable screen is installed on the stationary panel in the center of the door. When you need the screen door in place simply pull the retractable screen door out to cover the opening. When not in use, simply retract the door screen and it won’t obstruct your view or get in your way! Can I install a Mirage Retractable Screen on the door between my garage and house? This too, is a popular screen option. In most cases this is superior to having a traditional screen door. 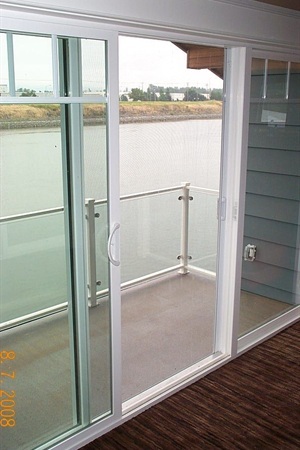 Rather than having to open both the door and the screen door, the Mirage Screen Door retracts when not in use. This means you only have to open one door while balancing your load of groceries. This is the practical solution that makes sense! 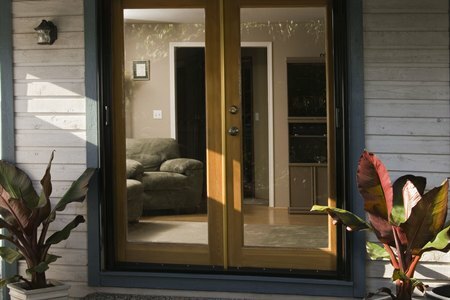 How do I install a Mirage retractable screen door? There is no need to worry about how to install your new retractable screen door. Each door screen is custom made for each application and as such, all Mirage retractable screen doors are installed by sceen professionals. For in-swing doors, your Mirage dealer will install the screen inside the doorjamb or outside on the door’s trim. For out-swing doors, your Mirage dealer will install the screen inside the home. Your authorized Mirage dealer will discuss all the installation details during your free screen door consultation. How long does it take to install a Mirage Retractable Screen? It can take between 1 and 2 hours to install a Mirage retractable screen door, depending on the type of application. What is the Mirage Retractable Screen Door warranty like? Mirage proudly offers a full one-year warranty on parts and labor and a limited lifetime warranty on all parts under normal use. Please note that the screen mesh and speed reducer products are specifically excluded from the warranty. Please visit ourWarranty page for more details or speak with your local dealer.